Something amazing happened this past weekend. As I was coming to the close of an amazing wedding reception at Saratoga Country Club, an older gentleman approached me. I thought he might be coming up to request a song, but instead he praised me on my performance as Master of Ceremonies during the course of the evening. Now, it’s not the first time I’ve heard this, but it was interesting because he didn’t point too much to my DJ set. Rather, he emphasized my ability to interact and work with the energy of the guests in the room. Earlier in the evening I had introduced an 18 member wedding party, each with their own personal bio. 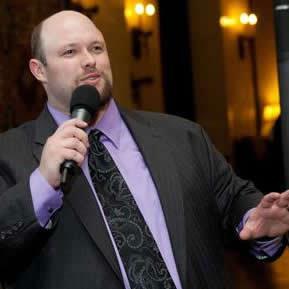 After dinner, I had performed a narration of bride and groom’s Love Story. Sprinkled throughout rest of the night were various other magic moments created as I interacted with their friends and family. I mentioned to him how much I appreciated his words. And I sincerely did, as anyone that can identify with the role I play as a MC is very exciting. He proceeded to tell me about his brother, who is a founding member of Chicagoland cover band called the Chicago Catz. They’ve been around for nearly 30 decades, and they are perhaps the most sought after band in the region. When President Obama or other high profile names come to town, the Catz are the ones called in for entertainment. This guy’s brother is the one that has my role. He’s the MC (and a musician) for the band. Now I’m feeling even better about this praise I’m receiving. He’s seen it. He does know that it’s hard stuff. After we talk a little more, he tells me that he also knows a thing or to about creating a dialogue with the audience. This is the guy that directed The Fugitive, a movie starring award winning actors Harrison Ford and Tommy Lee Jones. A movie that grossed more than $368 million worldwide and held the top spot at the box office for six week straight back in 1993. Turns out, for the last few minutes, I’ve actually been talking to film producer and director, Andrew Davis. Oh boy, now I’m really excited! Suddenly, this compliment felt as if I were actually nominated for an Academy Award for my stellar performance that evening. As if having this conversation and such genuine, unsolicited praise wasn’t grand enough, Davis asks for one of my business cards just before heading out for the evening (which was only 15 minutes before we were scheduled to end the night anyway). A recent post by Jennifer Sbranti, founder of Hostess with the Mostess, explored ways to utilize the ten colors from the PANTONE fashion color report of 2013. With colors like Lemon Zest and Nectarine, they just call to have a tasty apéritif for you wedding celebration or other special event. In fact, I’ve included the recipe for my own interpretation of nectarine towards the bottom of this post. 1. In the bottom of a cocktail shaker, smush the nectarine slices, mint leaves, sugar cubes, and lime until juicy. 2. Fill a old-fashioned (or other short) glass with cubed ice. 3. Fill cocktail shaker with ice and shake mixture vigorously for 15-20 seconds. 4. Straining only the ice, pour the cocktail over ice in your old-fashioned glass. 5. Umbrella or nectarine wedge garnish is optional… Enjoy! If you tried this or any of the other cocktails, please let me know what you think in the comment section below! This video came from one of my video friends out in Hawaii. Watch as the Kihei Community Center goes from bland to grand in under 10 hours. The reason I’m sharing it with you is so that you will better understand my role. 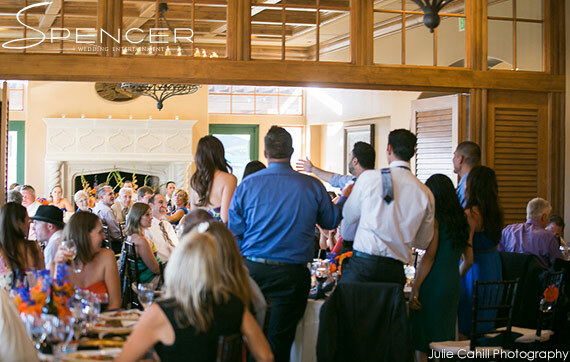 As an Entertainment Designer, one of my goals is to work together with you and your entire team of wedding professionals to transform a room – that can be as simple as a community center – into something magical. The tools are out there, let’s unleash your creativity and build your dream wedding today. 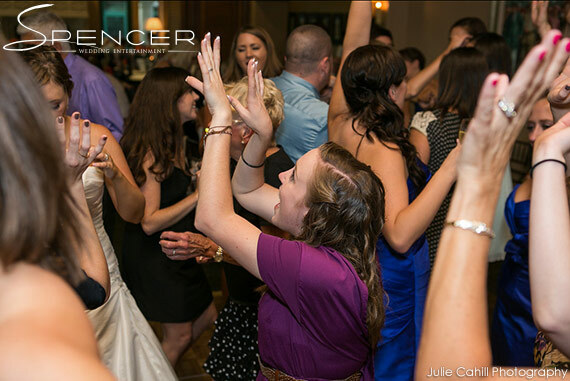 Movies have a big influence on many of the weddings I’ve done over the years, but only one can take top honors. The Princess Bride celebrates 25 years of memorable quotes, and they want you to know about it! If you register for the Brute Squad Community you could win 1 of 25 prizes (one a week for twenty-five weeks). Each winner will receive Princess Bride merchandise that may include a t-shirt, or Blu-ray DVD, or book (The Princess Bride: A Celebration) or similar product. Head over to sign up today! 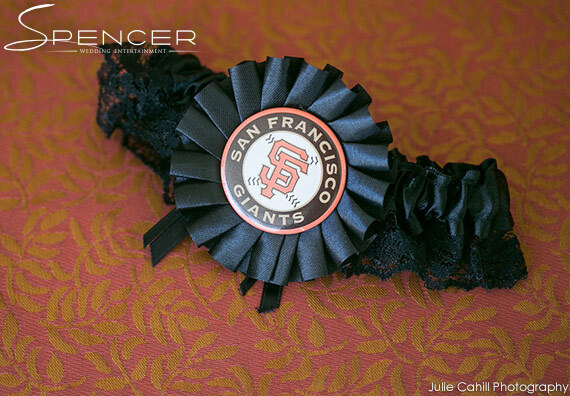 It was the two-year anniversary of when they first met, and a weekend carefully selected by Erica when the San Francisco Giants would be out of town. 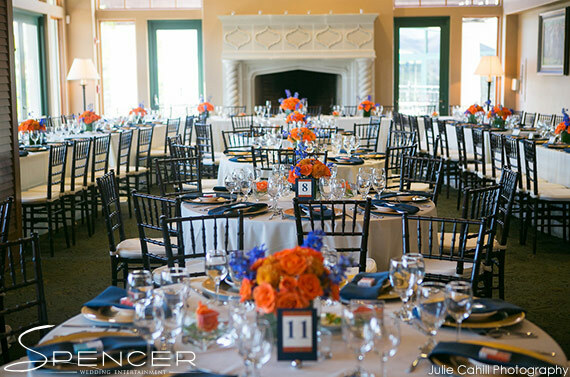 The colors for this fantastic wedding celebration were Cobalt Blue with Orange accents. 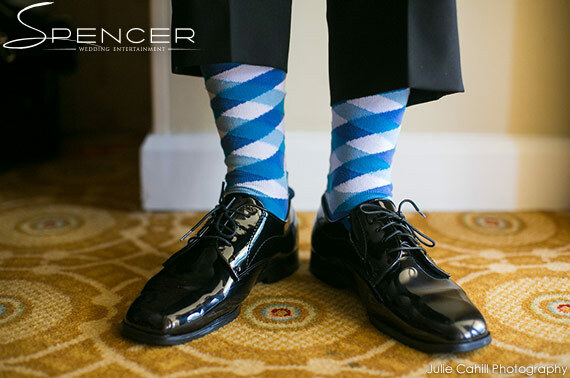 It made for beautiful bridesmaids dresses, and you had to love the socks worn by all the groomsmen and Alfred, the groom. 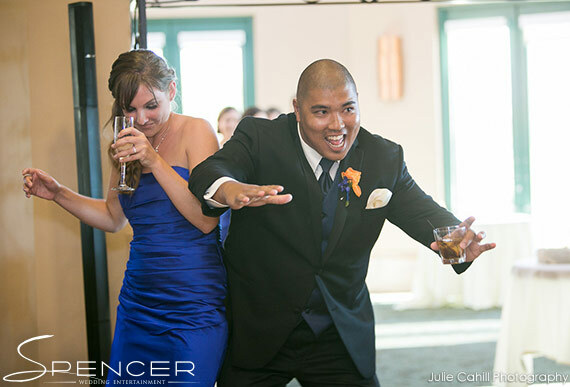 In fact, Erica and Alfred were a blast to work with for this San Ramon wedding ceremony and reception held at The Bridges Golf Club. 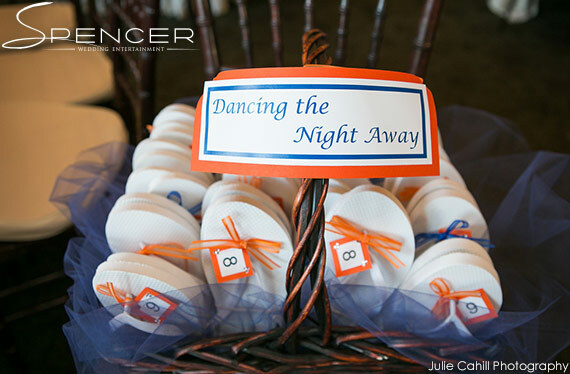 The introduction of the wedding party is a great time to set the mood or tone for the rest of the evening. With a “party” theme in mind, our four pairs of bridesmaids and groomsmen were appropriately welcomed to the room with the following theme songs: Party Rock Anthem by LMFAO, Get This Party Started by P!nk, Party in the USA by Miley Cyrus, and Party Like a Rockstar by Shop Boyz. Alfred and Erica were introducted to Crazy In Love by Beyoncé. 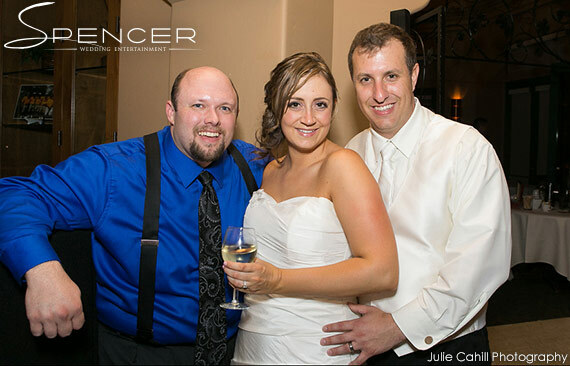 Everyone is familiar with guests tapping their glasses in order to get the bride and groom to kiss during dinner. We opted for a different route based on a suggestion in the book, The Best Wedding Reception…Ever!, which all my clients receive during planning. Each table was required to, as a group, stand and sing a song that has the word “love” in it. Then, and only then, would Erica and Alfred share a kiss for everyone’s delight. After the first two or three tables, it became a competition that also included several mash-ups of multiple songs, and some tables working together! 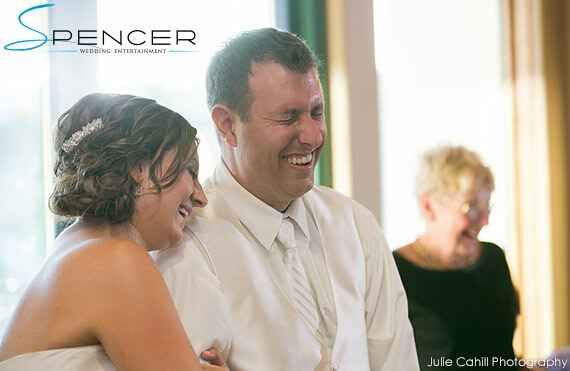 Perhaps my favorite part of every wedding is telling the Love Story of the bride and groom. Erica and Alfred didn’t disappoint, with great bits of humor and amazing stories of how much they love one another. In fact, they told me it was their favorite memory of the wedding day! 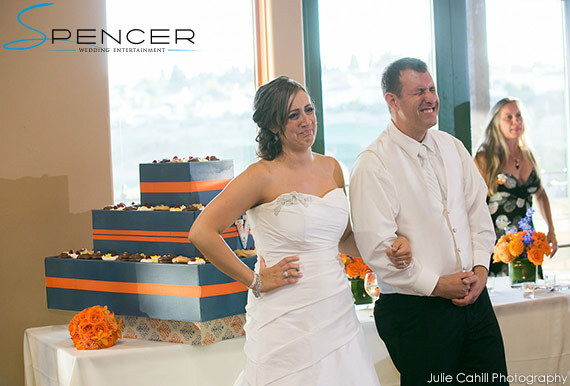 The magic of this wedding couldn’t have be captured better than with the unique eye of photographer Julie Cahill. She took all of the amazing photos you see on this page, and I thank her so much for them!